In Reynolds father's story we saw the decline of the castle estates, his father leaving on a pilgrimage and England left to fend for herself under an absentee King William left left his wife and only son to an unknown future. He like his king, ended his days in foreign country. When and how the Mohuns heard of Williams death we do not know. There was no body for a grieving wife to mourn and no father figure for Reynold to emulate. As a widow with a large estate, a decaying castle and a small child we do not know how she fared, it maybe that she remarried during the first ten years of Reynolds life. There is no mention of Reynold being a ward. Reynold was living in a country under a new king and his lands were known to be managed by at least six barons loyal to King John. As a very small boy he would be unaware of his inheritance and we do not know if his father estates was mismanaged, but if history is right about King John it would be him that would reap the benefits. To many people John was cruel, greedy and ultimately a failure as King, in these traits he was the exact copy of his brother Richard. Both sons disagreed with their father's policies and had fallen out with him over them. Richard rebelled and took up arms against his father, John never did, although he conspired sometimes with and sometimes against his elder brothers, Henry, Richard and Geoffrey. Henry II was often unfaithful to Eleanor of Aquitaine the children’s mother, their relationship was unsettled and stormy and this eventually lead to Eleanor being placed under arrest after she encouraged her children to rebel against their father. 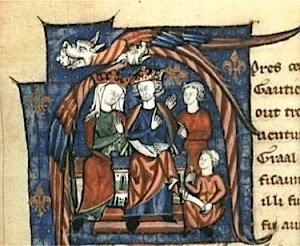 During the years of their marriage Eleanor gave her love to Richard, whilst Henry’s affections were with John, even though John was his fathers favourite he was given nothing in regards to lands and estates. ​"The four young ones of the eagle are my four sons who will not cease persecuting me even unto death. And the youngest, whom I now embrace with such tender affection, will someday afflict me more grievously and perilously than all the others." The problems he had with his wife and other three sons had made him bitter, he tarred the then loyal John, with the same brush. Reynold, it seems was loyal to the king and received Dunster Castle and chief parts of his inheritance in July 1204, Whichford in Warwickshire was made over to him two months later, he established his right to Brinckley as the heir of his grandmother Godehaut who had owned the manor. 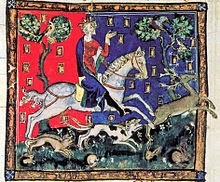 By 1205 the struggle over the succession with Arthur eventually led to the loss of English territory in France, but losing his lands to John seemed not to turn Reynold against the king, he took part in the invasion of France in the summer of 1206 when the sheriff was ordered to provide him with a ship at the Kings expense, four years later he accompanied King John on an expedition to Ireland, but it is not mentioned if he was part of King Johns armies in a later unsuccessfully attempt to regain France. For the rest of his reign, John continued raising taxes to pay for his campaigns, which is exactly what his brother Richard had done to pay for his private obsession, the crusades, and for this he was hailed in history as a hero, but John raising taxes to keep hold of lands that were his by right of birth, he was a villain. Eventually the Norman lands of Reynolds forefathers became the property of the French crown. Later is seems that younger generations of the Mohuns recovered some of the lands back from France. Some ruins of the castle are still visible in Moyons, on which the present Chateau d’Hainneville stands beside, Mohuns castle was situated on high ground that was once surrounded by a large deep moat full of water, where it is believed it had a central keep and a double line of walls. While John was king the Mohuns seemed to have moved up in society and Reynold, like his ancestors, awarded gifts of land and money to the church and signed charters in their favour. Reyonld had married Alice, one of the daughters of William Briwere and Beatrice de Vallie. Briwere was Justiciar, a position equivalent to a modern Prime Minister. Briwere, during the reigns of Richard I and John was one of the most active figures in government, it was Briwere that the character of Sheriff of Nottingham is based in the Tales of Robin Hood. 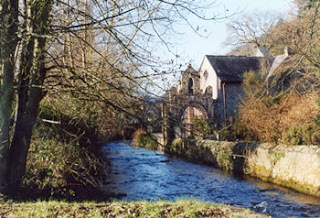 With Alice, Reynold had two daughters and four sons, Reynold his heir and William a benefactor of Cleve abbey and one of the founders of Newenham Abbey. He died at Norton in Cornwall in 1265 and is buried at the high alter at Newenham Abbey, he married Juliana de Vernon. Baldwin a priest, was rector of Brinkley in 1261. There was Richard, a daughter Anelina who married Patrick Frisell and Alice who died as an infant. Reynold died when he was just thirty in 1213 living his widow Alice to marry crusader William Paynal of Bampton in Devon, who died in 1228. Alice died after 1238 and is buried in the Church of St Mary's the Virgin, Axminster, Devon. Reynolds son and heir was a minor on his fathers death and did not receive the estates until 1227 and was initially in the care of the Dunstanville family of Cornwall.